Is your pet protected against life threatening diseases? Vaccination is a critically important aspect of preventative veterinary medicine focused on keeping your pet healthy and happy. Contagious diseases are present within our pet population. Many of these diseases are life threatening not only to your pet, but to humans as well. The single best way to protect our pets and ourselves is through vaccination. Rabies: This is a vaccine that is required by law for pets in most states. The rabies virus is 100% fatal to all mammals, including humans. It is important that we protect dogs and cats, as well as our ferrets and horses. Indoor only cats are not an exception as bats are frequent indoor visitors and may carry the virus. Dogs and cats alike are given a rabies vaccination at the end of their initial immunization series that provides them protection for a year. Rabies is then administered every 3 years throughout the rest of the pet’s life according to local laws. DAP: Distemper, adenovirus, and parvo virus are the main viruses that make up this vaccine. This vaccine is commonly referred to as the “distemper combo” vaccine, or sometimes the “5-way” or “7-way” vaccine. This is considered a core vaccine, meaning ALL dogs should be protected by this vaccine. Dogs not protected, especially young puppies, that are exposed to any of these viruses can become seriously ill or die. Treatment is expensive and these viruses are life threatening. Initial DAP vaccines are given when a puppy is 6 to 8 weeks old and boostered multiple times throughout the first several months of the puppy’s life. Once a dog has been properly vaccinated and built up adequate immunity a 3 year vaccine may be given for the remainder of the pet’s life. Bordetella: (Commonly referred to as the “kennel cough” vaccine) At CCAH Bordetella is often considered a core vaccine that is recommended to all of our canine patients. The Bordetella virus is responsible for an extremely contagious upper respiratory infection. For some dogs that are repeatedly exposed to high volumes of other dogs (i.e. dog parks, pet stores, boarding, groomers and dog shows) it may be beneficial to booster this vaccine every 6 months to maintain highest efficacy. We have this vaccine available for oral administration. Initial Bordetella vaccine is given between around 11 weeks and then boostered 3 weeks later. Adult dogs are boostered with the vaccine on an annual basis depending on their risk factors. Leptosporosis Immunization: Leptospirosis (Lepto) is a potentially deadly disease caused by the bacterium Leptospira interrogans. It affects dogs but can also infect a wide variety of domestic and wild animals, as well as humans. The organism is usually spread through infected urine, but contaminated water or soil, reproductive secretions, and even consumption of infected tissues can also transmit the infection. Introduction of the organism through skin wounds can also occur. Common carriers of the organism include raccoons, opossums, rodents, skunks, and dogs. The leptospirosis organisms rapidly advance through the bloodstream leading to fever, joint pain, and general malaise. Because the organism settles in the kidneys and actually reproduces there, inflammation and even kidney failure may develop. Unfortunately, liver failure is another common sequela to infection. Kidney and liver failure both have deadly consequences. Because of this Dr Rogers reccommends that most canine patients receive the vaccination. The Lepto vaccine can be included as part of the puppy series and requires a booster two to three weeks after the initial vaccine. Once the initial two injection series is complete the Lepto vaccine is boostered on an annual basis. Lyme Immunization: Lyme disease is a bacterial infection transmitted from a tick bite. This disease in known to be present in Knox County and is spreading in prevalence. A dog infected by this bacteria can experience several severe symptoms or be asymptomatic (showing no clinical signs of disease). CCAH recommends this vaccine for any dog that frequents an area where ticks are commonly found, not only dogs that live in rural areas, but pets that travel to local parks, bike trails, camping, etc. The Lyme vaccine can be included as part of the puppy series and requires a booster two to three weeks after the initial vaccine. Once the initial two injection series is complete the Lyme vaccine is boostered on an annual basis. Canine Influenza Vaccine: Canine influenza virus causes a highly infectious upper respiratory disease and there are currently two strains that are circulating in this country, H3N8 and H3N2. H3N8 originated on a Greyhound racetrack in 2004 and rapidly spread across the country. H3N2 was introduced into this country in 2015 from dogs imported from Asia and continues to circulate. At CCAH we carry the bi-valent influenza vaccine which protects against both strains, unlike human influenzas these do not change each year and vaccination is very protective. We recommend dogs exposed to high volumes of other dogs be protected with this vaccine. Risk factors to consider are similar to those listed under the Bordetella vaccine. The Canine Influenza vaccination can be included as part of the puppy series and requires a booster three weeks after the initial vaccine. Once the initial two injection series is complete the Canine Influenza vaccine is boostered on an annual basis. FRCPC: Rhinotracheitis, Calicivirus, Panleukopenia, and Chlamydia are included in this vaccine commonly referred to as the “feline combo”. Feline Herpes virus (the cause of feline rhinotracheitis) and Feline Calicivirus are estimated to be responsible for 80-90% of infectious feline upper respiratory tract diseases. Sneezing, runny eyes, runny nose, and fever are the most typical signs of infection. Both viruses are shed in secretions from the nose, eyes, and mouth of infected cats. Most cats are exposed to either or both of these viruses at some time during their lives, usually during kittenhood. Protection induced by the currently available vaccine minimizes the severity of disease, but does not prevent disease in all cats. Nonetheless, vaccination is recommended for all cats. Panleukopenia (also called feline distemper) is a highly contagious and deadly viral disease. A high percentage of cats with panleukopenia, especially kittens, die from the infection. Feline panleukopenia virus is shed in the feces of an infected cat and can survive in extreme temperatures and humidity for months to years. Until recent years panleukopenia was the most serious infectious disease of cats, killing thousands every year. Immunity induced by panleukopenia vaccines is excellent, and most vaccinated cats are completely protected from infection and disease. Kittens will receive an initial vaccine series boostered over the first few months of life then annually and every 3 three years following veterinary discretion. Leukemia Immunization: Feline leukemia is the leading viral killer of cats and is transmitted through close contact of cats. Outdoor cats, indoor/outdoor cats, and cats exposed to such individuals are at greatest risk of exposure to FeLV. Cats living in households with FeLV-infected cats or cats of unknown infection status are also at risk. 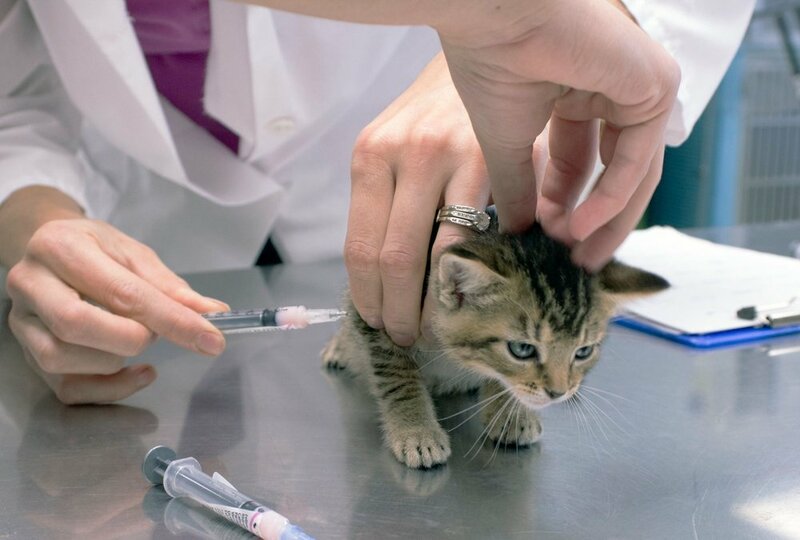 All young cats should be vaccinated with this vaccine per the American Association of Feline Practitioners (AAFP). Some indoor only cats may receive this initial protection then opt for a 3 year vaccine or discontinue it all together. This is an important discussion to have with your veterinarian. When introducing a new cat to your existing feline family we recommended testing any new additions with a simple blood test that quickly and reliably tests for this disease and 2 others. Cats that go outdoors should always remain current on this vaccine. It is important that we provide protection from disease for these pets as well. AT CCAH we have Distemper and Rabies vaccines labeled specifically for ferret vaccination. If you have a ferret that is not protected by vaccines or plan to adopt in the near future, it is an important preventative step to discuss with your veterinarian. CCAH has several large animal vaccines available. If you have any questions about vaccinating on the farm please feel free to contact our office.